I’m not very good with big news but hey, did I mention I’m writing a book? Yep. A big ole book, a real one, full of doll and toy patterns. And it’s going to be a STC/Melanie Falick Books book, pinch me! I’m happy to be able to spill the beans. I probably could have earlier, or waited a lot longer, but I don’t know what the protocol is. I’m always taken by surprise when I read people are writing books, shocked actually. It’s just seems like such a monumental project to take on. And that’s the shock and awe I wake up to every morning. No, really, it has been a lot of fun so far. Dreaming up projects and sketching and just sewing like a maniac, oh and can’t forget fabric shopping like a crazy person. It’s been awesome, but it is really weird not to be able to share. So I’m sharing! While I can’t really show anything I’m working on, I can talk in code and vaguely refer to things. I can gripe and moan when I’m stuck or ask for opinions or beg for pattern testers and man oh man, wait til you see the “design process”. I’m saving all my rejects in a giant bag. That ought to be good for a laugh when the book is out. I’m about halfway through the designing/sewing/instructions part and then will come all the writing. You’ll know when that part comes because I’ll probably fall off the face of the earth except for some grumbled curse words on twitter now and again. But no, I’m optimistic. I’m just going to pretend like it’s the blog and write right to you guys and hopefully it’ll come together easy peasy. Do you think they’ll let me say things like easy peasy? Tim’s doing the diagrams which look amazing so far and I can’t wait to spill who’s doing the photographs, so flippin exciting. So, ok, that’s it, my fun news. I’d better get back to it now. Congratulations! I can’t wait to buy a copy! Hillary this is so wonderful!!! Congratulations and do tell ASAP who will be shooting your book! Awesome!!! As with everything you generate, I’ll buy it. Probably more than one. Good luck! Yay! Congratulations. That is wonderful and can’t wait to get myself a copy. Oh my. I seriously cannot wait. I’m currently working on one of your pointy kitties right now. Love all of your patterns I’ve bought. I’ll definitely be a purchaser of your book. good luck! Can’t wait to BUY your book! Keep up the good work. YAY!!!!! I am so flipping excited!!!!! I don’t normally pre-order books but I will definitely be doing that for yours. I adore all of your patterns and can’t wait to read all of the witty things that you’ll add to the book! Good luck! Now that is a book that I would buy! Just found your site today and I LOVE IT!!! I want to make all the dolls. Seriously. Do you need an intern? j/k. I hope the new book has lots of patterns! I’m so jealous! What wonderful fun! I can’t wait to get my hands on a copy! i do not mean to sound like such a gusher, but this is the best news i have heard all year. you are the reason i took up sewing and the reason i try new things. i am so glad you are putting it into print. as for suggestions…anything and everything you do it cute, so i think you have it under control…but maybe a few really good things for boys. and if you have a moment, i would love to know what the doll hair is in the above photo. it looks perfect on her head, but i would love to get some of that on my needles. or is it under wraps? hope not. Yay! This is indeed very fun news. Congratulations! Ack!!! So excited for you and for me who gets to buy it! Congrats! this is awesome news, congrats. Congratulations to you! This is wonderful news. Good luck with the project and we’ll all be celebrating with you when the book is available. Fantastic news! Congratulations! I will be looking forward to the release and volunteer to test (big hand raised). So cool! Congratulations! I can’t wait. Did you say “pattern tester”?! Wonderful and very exciting news! I can’t wait to see the finished product! Congratulations! I’ve always thought you should write a book. I’ve read your blog for years now and you are one of the most creative and trend-setting bloggers out there. This is such great news not just for you but for us, your fans!! The problem with letting the cat out of the bag is that now I have to WAIT. that is fantastic news, yay you! (i guess i’m a little surprised this hasn’t happened sooner!) anyway, i look forward to it. I will test sew anything for you, if you need it! Congratulations on your wonderful news. Oh my gosh, congratulations! I am so very jealous. Can’t wait to see it. FANTASTIC news! Congratulations and I can’t wait to purchase my own copy. I do believe future festive moments (Christmas, bdays, etc) will be very good for the kids in my life. Thanks for making that happen. Congratulations!!! I can’t wait for the book to come out either. How long must we wait? So excited for you! Hand sewing patterns too please! I’d love to test patterns for you. oh that’s so great. I’ve been wondering when is it your turn to do a book, since all the other famous bloggers are doing it. congrats! congrats! so exciting. can’t wait to see it in real life. I just love the way you and your husband design things so I know I’ll be pre-ordering this book! Congrats! Also, can I pretty please be a pattern tester? I need some inspiration and every time I look at something you’ve made I am thinking I would be so happy making something like that. I would love to see a pattern for a tall spotted giraffe in the book. I made up a song for my little boy about one and so I really need to make one. I can’t wait to see it best of luck. The pull toys have always been a favorite of mine. I’d love to see those! Awesome. It is about time a publisher figured out you’d make an excellent craft book author. Can’t wait to see what you come up with. Congratulations and good luck with the writing/designing! Melanie Falick Books are so well-done – beautifully designed and photographed. What a wonderful publisher for your first book. Can’t wait to see it! Holy cow I am SOOOOOO excited!! Let me know when I can preorder. Holy cheese puffs! I’m so excited! I’ve been saving a space on my bookshelf for just such an occasion! i am so so happy for you! you are the reason i took up crafting, sewing, everything. and it has changed my life (and left my pocketbook a little lighter, ahem). I can’t wait for it…the wait will be awful. I **love** the girl in the photo she looks like the girl in my plate & book from childhood, joan walsh something? I know your book will be wonderful and I will give it out to everyone for presents with a kit. 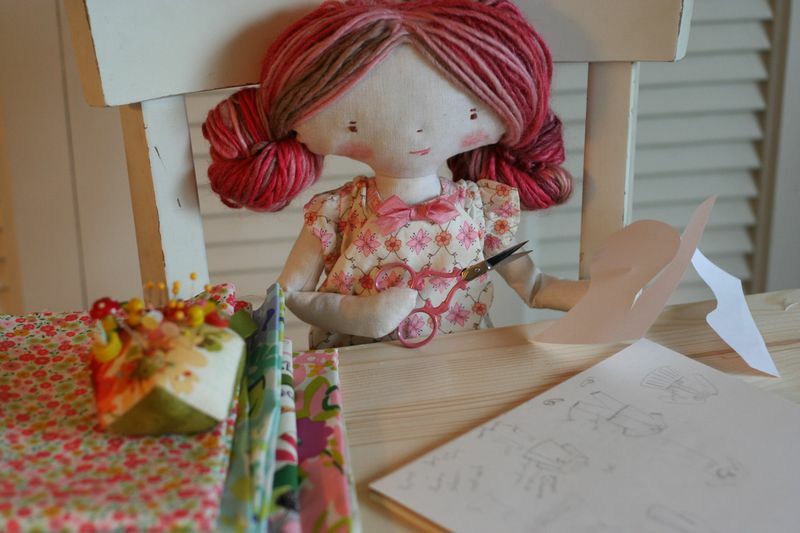 I am so proud to own two of your actual dolls…and many more of my own from your patterns, they are always the cutest! I still think you should do a children’s story book with your characters though. Seriously, I was wondering how could book editors be so blind as not to beg you to write a book, since you have such a tremendous ammount of super cool, creative, FRESH stuff going on!!!!! Congratulations!!! I want to be a pattern tester, if you please. Pretty please with a cherry on top? wow! Congrats. Melanie Falick’s books are AMAZING–I’m sure you’re an incredible team. Ohh, exciting news! I will be snatching that one off the virtual shelf as soon at it goes on sale! Congratulations! Writing a book is crazy. I’ve been a part of writing a book, albeit a cookbook, but it’s hard. My advice: Work, every single day on it. I’m so excited for you and will buy a ton of your books!! Congrats again. It’s awesome news! you and STC – match made in heaven. can’t wait! WOW! Congratulations! I can’t wait to pre-order it! Yay! So glad you’re joining the book “club”! You picked an excellent publisher. Congratulations Hillary! That’s great news! Congratulations! I have been *waiting* for this. Can’t wait to get my hands on this. It goes without saying, but do keep us updated. OMG! Thanks great. Can’t wait to pre-order! I loved to see somethings in there for little truck crazed, lego addicted, why do you always makes stuff for my sister, 5 yr. old boys. I know it’s all been said here, but one more “I’m excited” from me won’t hurt! I AM excited about this. I love your designs a. lot. A whole book full. Wonderful. I said to my husband a few months ago, “She’s writing a book.” But Melanie Falick – that’s the best. Congratulations, Hillary! Congratulations!!! Also, that doll has the best hair of any doll, anywhere. I love it! That’s terrific news! VERRRRRRY exciting!!!! This is sooooo great! Congrats! You deserve a big fabulous, successful book with all of your super cute patterns in and I for one can’t wait to get a copy! How exciting. I know the book will be a huge success. I think they’ll let you say things like easy peasy. It’s your voice and it would sound all wrong if they tried to make you talk otherwise. Looking forward to it and please count me in if you need any testing/proofreading. I’d be delighted to help. OMIGOSH THAT IS AWESOME!!!!!!!!!! CONGRATULATIONS!!!!!!!! Hooray! Congratulations! So many people are going to be thrilled to have a book full of your patterns! yyyyiiiiiippppppeeeee!!! congrats, congrats, congrats!!! just a bit jealous and nervous, and excited all at once. Wow, that about all I can say, is Wow! yahooooooo! congratulations!!! twill be a goodie! Congratulations! That will be something to look forward to! You know, I was wondering why your posts had gotten short N sweet. I am eagerly looking forward to your book and I hope that you include ideas for boys. It is so hard to find things for my little guys. Congratulations! I wish you lot of success! congrats! You can do it!! her own baby, if that make any sense. Good luck, I am so excited for you! Great news for us! And congrats to you. CONGRATS! How exciting!! That is very fun news indeed– can’t wait to hear more about it! I’m also excited about your book! Please, please put in some good doll patterns, and I second (or maybe third) the idea to add in some cute patterns for boys. I have three nephews and a niece and would like more ideas about what to sew them. Yay, im soooo happy and excited about your book! Sooo looking forward to get a copy of it! Have a lovely merry day and love to you and yours! That is great news! Congratulations! I can’t wait to have it! Wow!! How wonderful!! Any idea when it will be done? I’m soooooo excited!!! Wow! Congrats! can’t wait to get my hands on your book! How exciting! awesome news, congrats! my hand is up up up for pattern testing~!! Congrats!! What great news – the world needs a hard copy of the wee wonderfulness you conjure up. Finally! Congratulations, I can’t wait to see the finished product. How fun! I’d love to be a pattern tester when the time comes. Good luck with that, I can’t wait to buy YOUR BOOK! Oh this is great news! So many talented people are writing books these days, and I am so glad to see you added to this list! I have been waiting, thinking you would be next. I am sure your book will be fabulous…I will totally be buying a copy! CONGRATULATIONS! I’m super excited about your book- i know it’s going to be fabulous! Can’t wait to get a copy! So pleased to hear you’re writing a book! It’s one of those all-is-right-with-the-world kind of moments. Aww Congrats on the book! That is so awesome. Congratulations! Can’t say that I’m all too shocked at the news. Don’t forget to breathe, and have fun. YES!!!!! I’m sooo excited for this book!!! 🙂 How long must we wait??? That’s so great. I’ve so wanted to find a good new doll making book. I’m sure your’s will not disappoint. Of all the wonderful things you make, your dolls have always been my favorite. Good luck! Wow! I was thinking just he other day “Wouldn’t it be great if Wee Wonderfuls had a book?” and then I checked you site and you are making one! I can’t wait to see what kind of yumminess you put inside (and you talk in your book the way you do on here it’s going to be a wonderful read). Congrats! I can’t wait to buy it!!!! This is the best news EVER. I have a few of your patterns and they are my favorite … I can’t imagine a whole book full. Good for you. I would love to test a pattern … I’ll keep my eyes open for that post. Cheers. Pattern tester…oh pick me! I am an advanced beginner when it comes to dolls so should be just about the target audience…lol. Don’t ya think? This is fantastic!!! Of the craft blogger books out there I always thought you would be the best. I figured maybe you were happy self-publishing and that’s why you seemed to be the only blogger without a book deal. Your designs are so terrific and the patterns are so well constructed and will make a great book! I’m thrilled it will be by STC, that means the photos will be amazing!!! Oh WOW!!! Congratulations! I am sure it will be amazing. Hip Hip! Yeah for you! I love bean, spilled ones too…. Can a girl have too many pattern testers? congratulations, hillary! i’m very excited for you! How exciting! I am THRILLED! What wonderful news for all of us! You are so talented and this is a great achievement! Congratulations! I can’t wait till it’s available. I hope the doll in the picture will be in there! Wow. I am so excited for you. I will definitely buy that book. Awesome awesome awesome! I am so thrilled for you! You are brilliant so I am sure your book will be a masterpiece! Hillary, all I can say is its about time you did a book! I am so excited! I hope there will be some of your extremely inspired quilts in there. Please PLEASE do a signing at a local Arlington heights, iL store! I would love to meet you! Congratulations on the book deal! I can’t wait to see it. I LOVE, LOVE, LOVE STC/Melanie Falick books and, of course, your work! Congratulations, again, and good luck!! !